Breakfast this morning was a bowl of cereal inspired by Megan's post about her berried cereal! 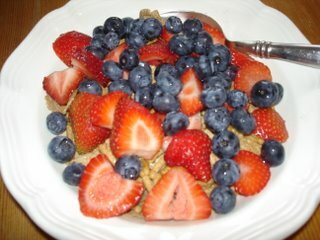 I put blueberries and strawberries on Kashi 7 Grain Cereal. I love this cereal. 7 grams of fiber. I miss the old name though.. Kashi Good Friends was cool.... so was the weird design on the old box. 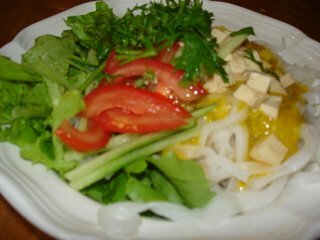 For lunch today I made a noodle bowl... also inspired by Megan. Good Friends is now called 7 Grain? A-ha! So that couple isn't on the box anymore? Sadly no! That box was so geeky that it was cool, don't you think? Plus, it was so distinctive that it was always easy to find. No, Good Friends does still exist! I think you are eating the smaller box cereal?